Make no mistake, sophomore Tyus Battle is carrying the expectations of being the lead dog for the 2017-2018 season. The 6’6” shooting guard started 25 times as a freshman while finishing as the third-leading scorer at 11.3 points per game. While slowed at different times by a foot injury and a severe cold, Battle finished with a flurry. Over the final six games of the season, Battle averaged 18.5 points per game on 45.7 percent shooting from the floor. Battle showed a solid stroke as a freshman, shooting 43.3 percent from the field, making 60 triples at a 36.6 percent rate, and connecting on 79.8 percent of his foul shots. The Orange will need him to score at least that efficiently while taking on a greater offensive responsibility, as well as improving his rebounding (2.76 boards per 40 minutes). Junior Frank Howard will start next to Battle atop the 2-3 zone after an up-and-down sophomore season. Entering last season as a starter, Howard played well early, posting averages of 7.8 points and 6.9 assists per game over the first 11 games. But, after logging 86 points and 76 assists in 267 minutes early in the year, Howard had only 63 points and 44 assists in 266 minutes over the final 23 games of the season. While his shooting percentages improved over his freshman season, Howard’s shot still needs work. It is hoped that Howard’s size and Battle’s season of experience in the zone will shore up the top line of the zone, leading to a much better overall defense. 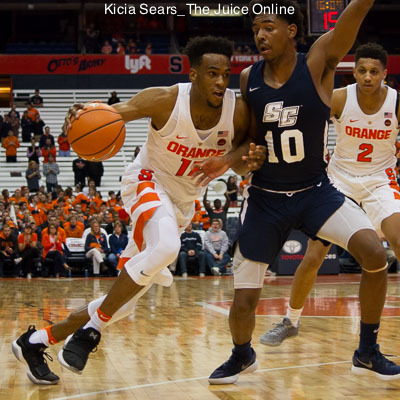 Graduate transfer guard Geno Thorpe will nudge Jim Boeheim into playing a three-guard lineup at times, sliding Battle to a forward spot on defense. Thorpe, a 6’3” combo guard, led South Florida in points (15.1 per game), assists (129), and steals (44) last season. After averaging just over six points in two campaigns at Penn State, Thorpe’s scoring jump at USF came in large part because he developed his shooting range while sitting out as a transfer. After shooting just over 30 percent from deep in two seasons as a Nittany Lion, Thorpe hit 39 threes at a 37.5 percent clip last season. If nothing else, Thorpe will likely serve as an offensive boost off the bench. 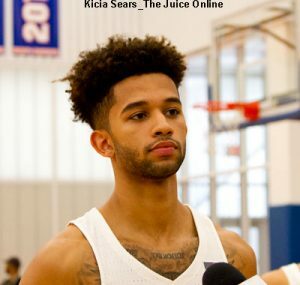 With those three guards ahead of him in the rotation, Howard Washington is likely the odd man out as a freshman. A 6’3” point guard from Buffalo and lifelong Syracuse fan, Washington spent two years in high school playing for Montverde Academy in Florida, then finished up with a year at Athlete Institute Prep in Ontario, Canada. A solid all-around point guard who had originally verbally committed to Butler, Washington has drawn comparisons to former SU point guard Tyler Ennis. Yet to play in a game for the Orange, Matthew Moyer has a year of experience at SU after redshirting his freshman year. A 6’8” forward, Moyer prepped at South Kent and was named the 2016 Connecticut Gatorade Player of the Year. Moyer finished that season a consensus top-100 recruit, but ended up redshirting during last season due to a foot injury. In the two exhibition games, Moyer showed the look of a scrappy player who needs to refine his shooting touch. While he has shown the ability to can the mid-range jumper from the foul line area, his shot showed inconsistency from other areas of the floor. The other starter at forward is freshman Oshae Brissett. Brissett, a 6’8” forward who spent two seasons as Findlay Prep in Nevada, closed his high school career as a teammate of Washington at Athlete Institute Prep in Ontario, Canada. Long and athletic, Brissett was named the 2017 Biosteel All-Canadian High School Player of the Year after averaging almost 23 points and 10.5 rebounds per game. Brissett showed a combination of skill and aggression in the two exhibition games that suggests he might be the second option on offense from the jump. 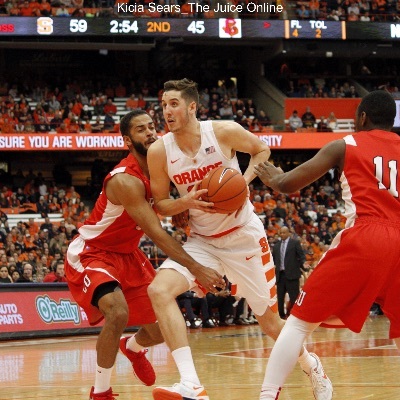 Marek Dolezaj, a 6’9” forward from Slovakia, was the last addition to the Syracuse freshman class. Not just the last to sign with the Orange, Dolezaj was also the last player to arrive on campus, but he had a good reason to be tardy. Although it may have helped him to be on campus over the summer, Dolezaj made good use of his time, averaging 16.9 points over eight games for the Slovakia under-20 national team in international play. Two things are apparent when watching Dolezaj on the floor. The obvious one is that he will need to add weight and strength to his rail-thin body. Less obvious is Dolezaj has a solid understanding of the game, showing anticipation on both ends of the court, including when spearheading the Orange full-court press. Paschal Chukwu has made a return to health from an eye injury that limited him to seven games in his first year at SU. Sporting a pair of goggles, Chukwu has a line on the starting spot at center, where he uses every inch of his 7’2” frame to deter opposing shooters. After averaging 2.75 blocks per 40 minutes as a freshman at Providence, Chukwu found the change to the Orange 2-3 zone a good one in his limited minutes last season, boosting that rate to 5.19 blocks per 40 minutes, albeit mostly against lesser competition. Chukwu is still raw on the offensive end, as well as susceptible to fouling, like many inexperienced shot blockers. Behind Chukwu is the fourth freshman on the roster, Bourama Sidibe. Sidibe is skinny, but his 6’10” frame and high level of activity help him be a deterrent around the rim to opposing shooters, as well. Ranked as a four-star prospect by one scouting service, Sidibe also shows a higher level of polish on offense than his fellow center, as evidenced by his 15.2-points-per-game average as a senior at St. Benedict’s Prep. Sidibe also backed up that offensive output by averaging over 11 rebounds and nearly three blocked shots per game as a high school senior.